Are you a small business owner spending a lot of dollars on content marketing these days with little to show for it? If you’re not generating the leads you expected then perhaps the problem is with the content itself. You see there’s such a large amount of content on the Internet these days that it’s become nearly impossible to stand out. That’s why it’s extremely important that small businesses learn to market themselves to hyper targeted audiences also called a buyer persona. High bounce rates in your Google Analytics report are tell tale signs that you need to do a better job targeting your content to very specific groups of visitors. 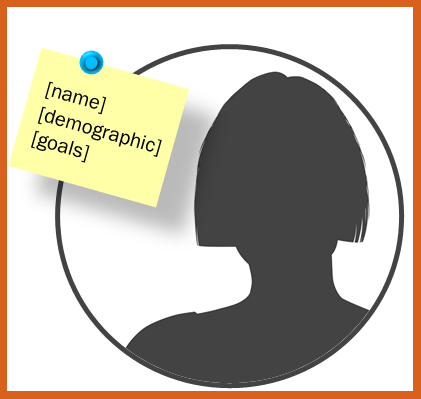 A simpler way to tell if you need to target your content to specific personas is just to keep track of the leads you generate from your content marketing efforts. Developing buyer personas for all of your prospective visitors will help you to create more relevant content and should result in lower bounce rates and hopefully increased sales. So here’s the skinny on the what, why and how of buyer personas for your small business (by the way when I use the term small business I mean any business generating under $20 million green backs). A buyer persona is simply a made up representation of ideal customer for your small business. Just because it’t fictional does not mean it’s not based in fact. You want to develop your buyer persona based on actual market research and real data from your existing customers. The more relevant information you can come up with here the more relevant the content you target towards this persona will be, so sweat the details. Consider the following when creating your buyer persona(s). What things are they trying to achieve, what are their goals. Identify pain points. Ask yourself – What are they worried about? What business issues keeps this person up at night? Remember the more detailed you are, the better. Most small business content marketing efforts can be compared to a shot gun blast. If you fire a bunch of pellets you know you’ll hit something and in the process hopefully your content hits one of your ideal customers. On the other hand carefully crafting buyer personas will give your small business marketing structure and insight for your company. Creating a detailed buyer persona is more like firing a rifle. It allows you to choose where to focus your time, guide product development, and allow for alignment across your organization. As a result, you will be able to attract the most valuable visitors, leads, and customers to your business. Hey we drink our own Kool-Aid here. Can you tell that this article is hyper targeted to a very specific buyer persona? We’ve created a persona we call Sam The Small Business Owner. Notice in the very first paragraph in the first sentence we say “Are you a small business owner”. We address a very specific problem small biz owners like Sam may be experiencing. They’re spending loads of cash on marketing with very little to show for it (also in the very first paragraph in the very first sentence). And we addressed a pain point small business owners have in common – they need leads to keep their sales people busy. We could have hyper-targeted this even more by addressing a demographic by titling the post something like – How Philadelphia Small Business Owners Can Increase Sales.